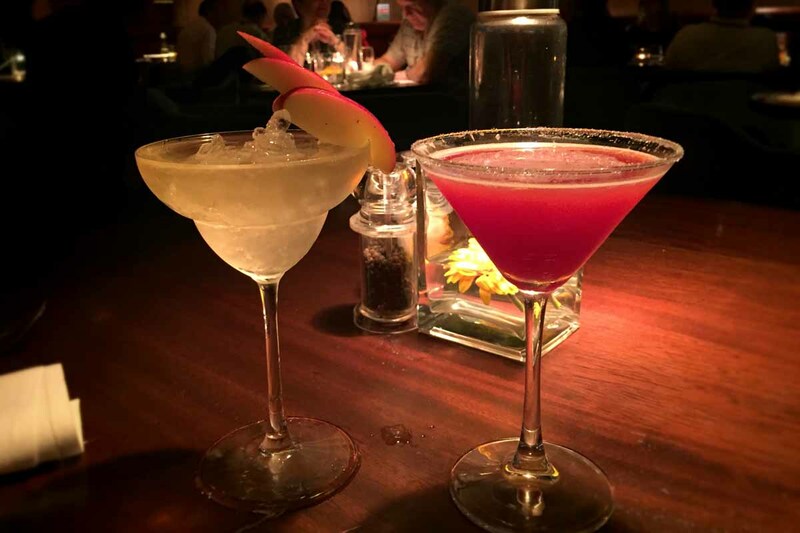 Yesterday we shared with you our recent trip to the Clandeboye Lodge Hotel in Bangor, Co. Down (which you can read here), and today we’re back with a review of our dining experience at the Coq & Bull Brasserie at the hotel. As we were staying in the hotel, we booked a table for 7.30pm to give us ample time to relax in the hotel before enjoying our evening meal. As we went down to the brasserie we could see it was already getting busy, an had a vibrant atmosphere. As this was our first time dining at Coq & Bull, we knew the busy dining room was a good sign. We were greeted by a member of staff and took a seat in the lounge area to enjoy a drink before taking a seat for dinner. The decor in both the lounge area and dining room was spectacular. 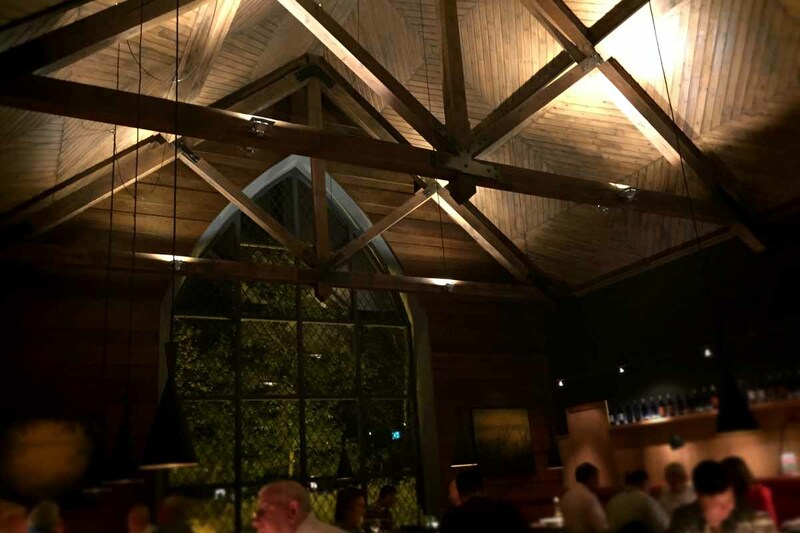 The brasserie is set in what looks like an old converted church, with an impressive vaulted ceiling and arched window leaving a real impression as you dine. 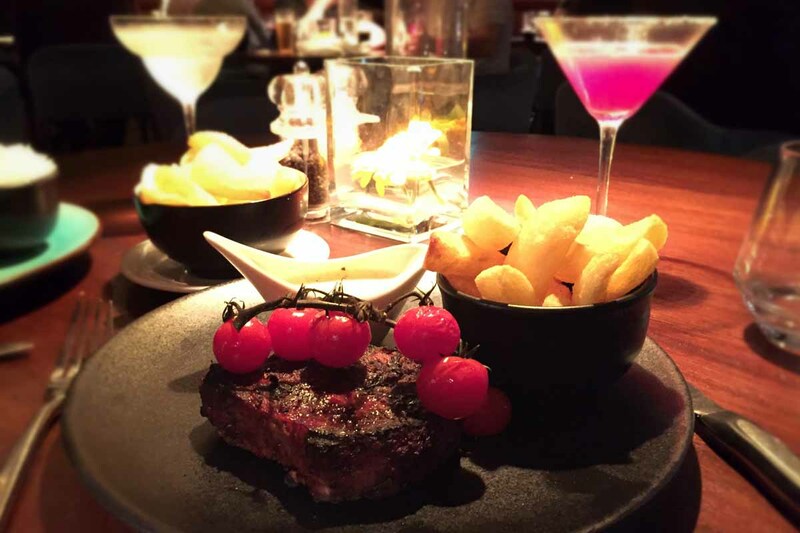 We sat down to look at the menu and a number of dishes jumped out at us, with the steak menu in particular getting our mouths watering. We put in our order and couldn’t wait to get started. 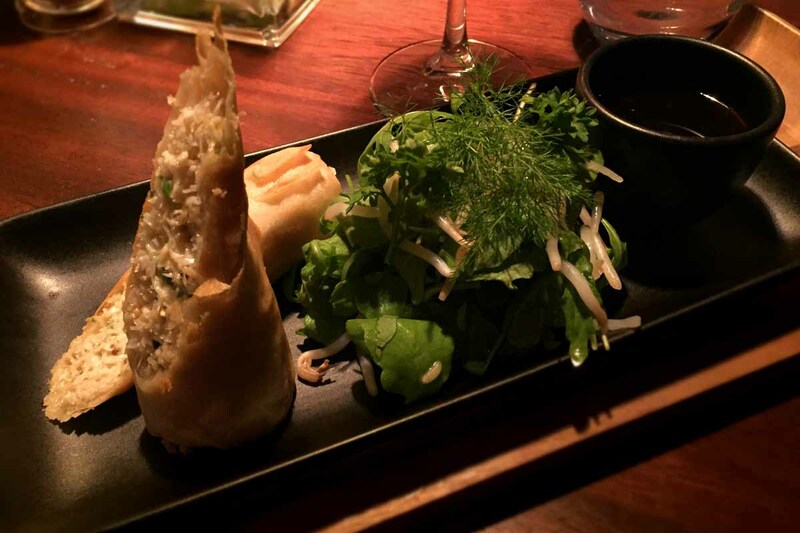 For starter we opted for the homemade white crab spring roll, which came served with a citrus and herb salad and a sweet soya, chilli and coriander dipping sauce. Usually spring rolls have little meat in them, compared to the usual filler ingredients, but this spring roll was packed with deliciously fresh white crab meat. The herb salad was the perfect cleansing accompaniment to the fragrant and spicy dipping sauce. Punchy and fresh, and a generous portion size. The perfect way to start the meal. Nial is a big curry fan and as soon as he saw the vindal on the menu, he just knew it was the dish to go for. 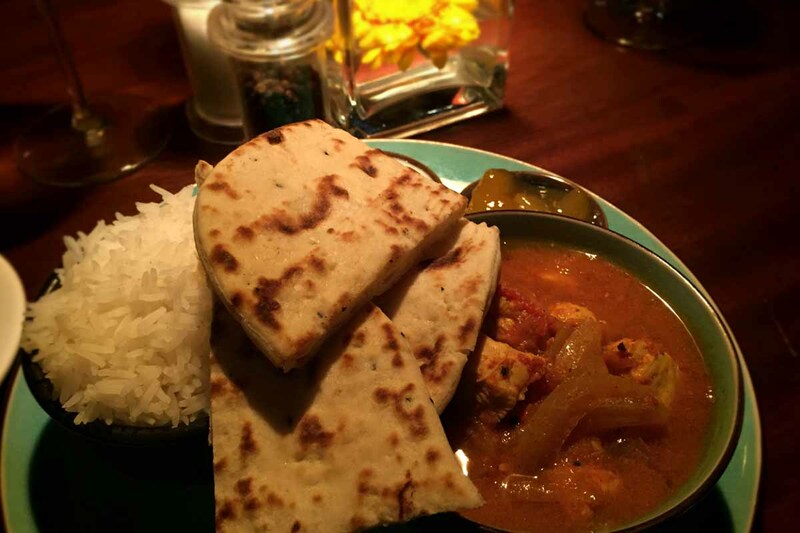 The vindal certainly packs a punch but isn’t quite at the heat level of a vindaloo (although if you’re not a fan of hot and spicy dishes, then this probably isn’t for you). The curry was served with a chutney which added a sweetness to the dish, and a mint raita to cool the curry and add a freshness to this dish. These accompaniments worked so well with the curry, and the naan bread, basmati rice and chips provided plenty of variety with each bite. The fillet steak was cooked to perfection and had an intense char-grill flavour which really enhanced the cut of beef. The beef was served with sweet, roasted vine tomatoes, crispy chunky chips, and a choice of sauce. Helen opted for a fresh herb and garlic butter sauce but there was also a choice of classic peppercorn or bone marrow gravy. Another great plate of food and a definite winner. No doubt the steaks at the brasserie are popular with the locals as we saw many hit the tables of other diners. When it came to dessert we decided to share (we know), and went for the brasseries signature dessert as recommended by our waiter. 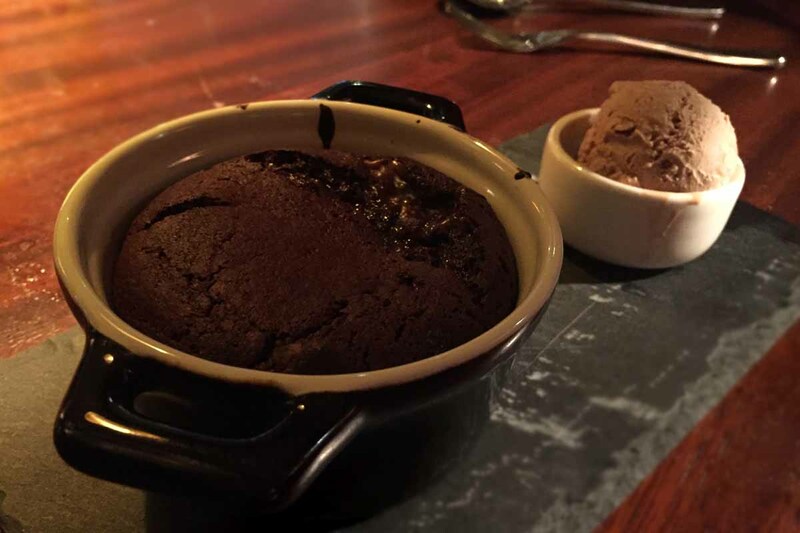 We didn’t need a great deal of convincing though, as a hot chocolate pudding with salted caramel, and a salted caramel ice-cream is just all sorts of yummmmmmm! 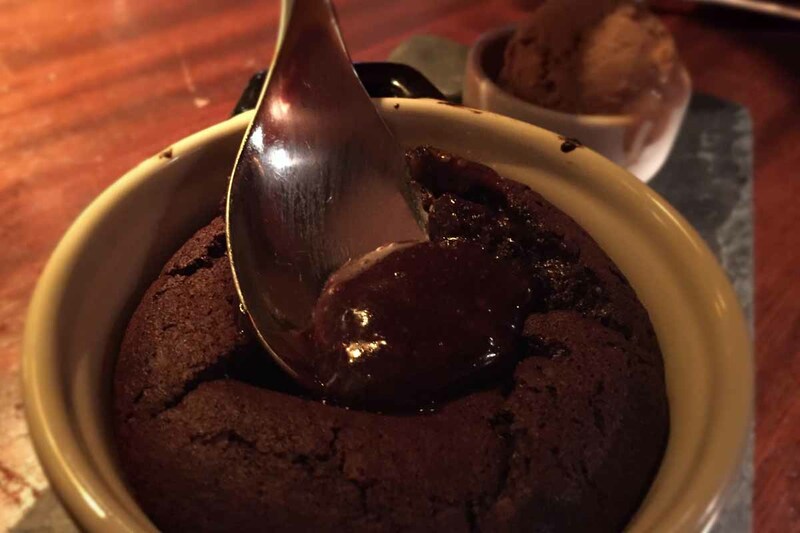 The puddings come warm, almost like a chocolate fondant, so you do need to wait 10 minutes until it hits the table, but boy is it worth the wait. The salty, sweet and dark bitter flavours of the pudding are a match made in heaven, and the ice-cream adds a welcome cool element to the dish. A great way to end the meal, and we had to refrain from ordering another pudding. We were certainly impressed by the food on offer at Coq & Bull Brasserie and can’t wait to visit again when we are down in the Bangor area. We really liked the menu and thought it provided a great choice of dishes for autumn / winter dining. Each dish on the menu is paired with a recommended wine, and while we didn’t opt to take wine, the diners around us certainly availed of the wine recommendations. One of Northern Ireland’s most famous chefs of recent years, Nick Price from Nick’s Warehouse is a consultant chef for the brasserie, and has helped the team put together a great menu. If you were a fan of Nick’s Warehouse then you’ll love the food at Coq & Bull Brasserie. 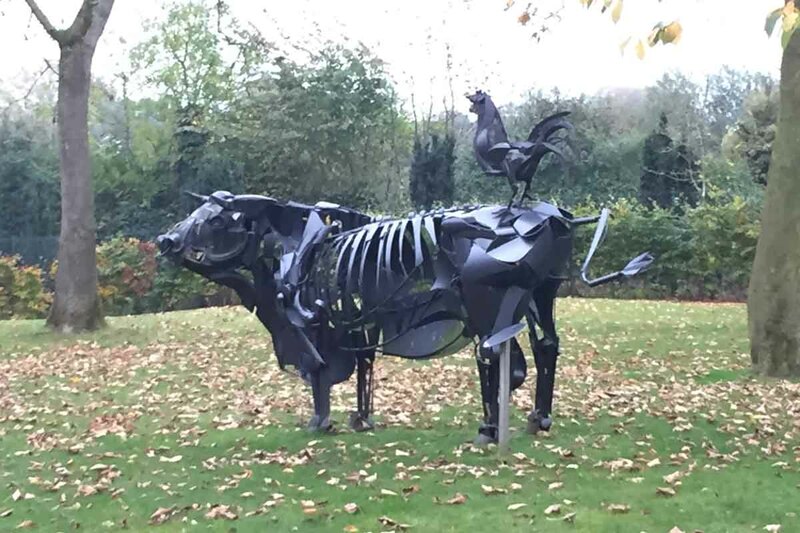 If you visit, be sure to take the chance to get a photo with the huge Coq & Bull spit sculpture outside the hotel, which featured on Heston Blumenthal’s Channel 4 show, Great British Food. You can read more about this over on the Coq & Bull blog. 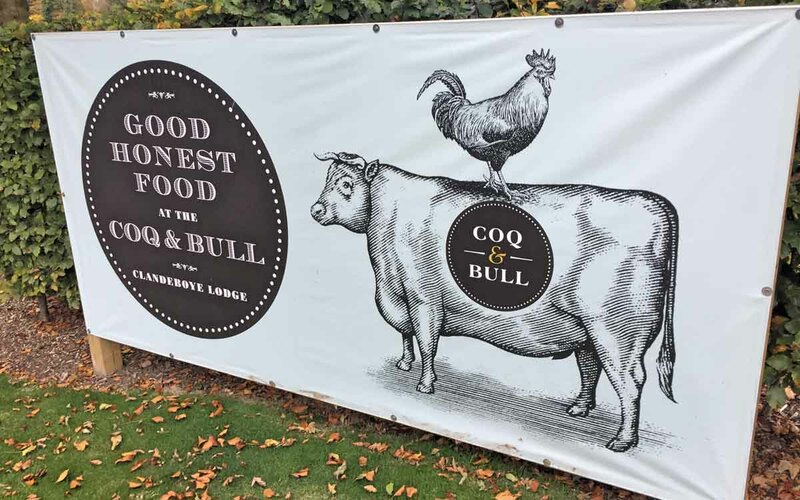 Have you dined at Coq & Bull? We’d love to know what you thought of the food at the Coq & Bull Brasserie. Let us know by commenting below or sharing your thoughts with us over on Facebook and Twitter.